A dental crown can be used anytime a tooth may need to be capped in order to restore and maintain its health or for aesthetic purposes. Dental crowns are different than several other kinds of cosmetic dentistry options because you won’t have to lose your entire tooth, but can preserve the remaining tooth. At The Dentists of Omaha, our skilled cosmetic dentists can determine if your teeth are good candidates for dental crowns and discuss the entire process with you. To schedule a consultation about tooth crowns or other cosmetic dentistry needs, please contact us by calling Hillsborough: 402-445-4647, Village Pointe: 402-505-7474, Ralston Square: 402-733-4441, or Dundee: 402-502-5593 today. What Do Dental Crowns Fix? A porcelain dental crown is expertly fit to your tooth’s individual size, shape, and color so that it blends in seamlessly with your smile and bite. Our dentists will take our time to ensure that you’re happy with the feel and look of your crown. 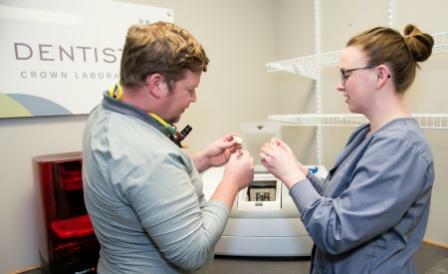 Dental crowns are expertly made in a lab that is outside of our Omaha dental office. Because of this, dental crowns require two visits. During the first visit, we will prepare your tooth for the crown by removing any portions of it that are too cracked or unhealthy to remain. Once the tooth is prepared, we will take impressions of your teeth. We will ensure that you’re happy with the feel and fit of these impressions and then they will be sent to the lab to have your crown(s) created. At the lab, the crowns are digitally made to ensure a perfect fit and perfect color match. While waiting for the lab to create your crown, we will fit you with a temporary crown. This will be permanent-enough that you will still be able to eat, speak, and care for your teeth without many changes to your normal eating and dental care habits. After 2-3 weeks, your dental crown will be ready and we’ll have you come back in to one of our four convenient locations. Our dentists will remove your temporary crown and place the permanent crown, making adjustments as we go to ensure that your bite is perfect. If you believe that you have a tooth or teeth that could be preserved through dental crowns, please contact The Dentists today. Tooth crowns are a great way to avoid more invasive and expensive treatment. The Dentists has multiple locations in Omaha; find the office near you by calling Hillsborough: 402-445-4647, Village Pointe: 402-505-7474, Ralston Square: 402-733-4441, or Dundee: 402-502-5593. We serve all of our Omaha residents conveniently, as well as patients in nearby Bellevue, Lincoln and other areas. Disclaimer: Official website of The Dentists of Omaha, Hillsborough, Village Pointe, Ralston Square and Dundee, NE. The information throughout this dentistry website is not intended to be taken as medical advice. The information provided by The Dentists of Omaha is intended to provide general information regarding comprehensive dental services for residents in the greater Omaha, Nebraska area. If you are interested in finding out more, please contact our dental offices today for a personal consultation. This website is not intended for viewing or usage by European Union citizens. Read our ADA compliance disclosure. Copyright © The Dentists. Website Designed, Developed, and Optimized by Page 1 Solutions, LLC.